Dynamic Business Informatics Ltd. (DBI) is a software development and support company distributing the Diver Solution, developing products and applications derived from the Diver Solution, and offering business consultancy services. 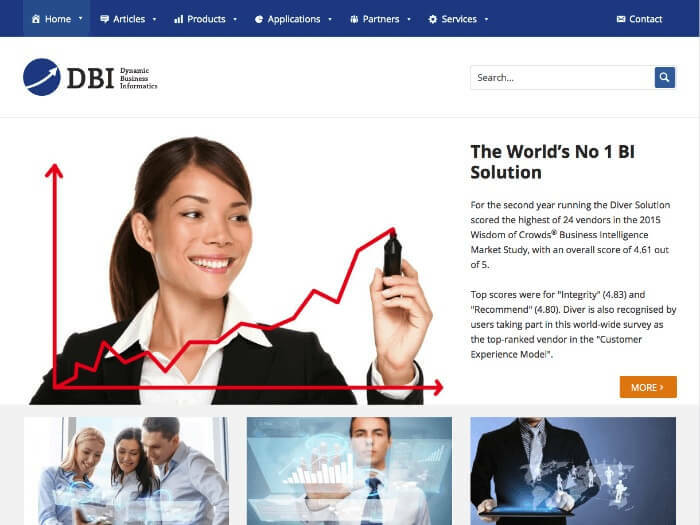 Cubecolour built the DBI website on the WordPress content management system using the StudioPress Genesis Framework with a custom child theme. Cubecolour handled all the design and technical aspects for our new website including designing a logo. We were impressed by the options offered according to our brief, and the resulting theme which represents our aspirations. We are very pleased with the user friendly interface which we use to add and manage content ourselves. Follow up support is excellent. Cubecolour answers our questions about best practise very promptly and professionally, and we have been extremely happy with the results of our online presence.